From wizards and fairies to ghosts and goblins, wearing a Halloween costume is one of the highlights of the day's festivities for many children. Whether your child is going trick or treating or attending a Halloween party, choosing a costume with the following safety tips in mind will help to keep children safe throughout the day. Fire is one of the biggest Halloween dangers, and it's something you should consider when choosing a costume with your child. 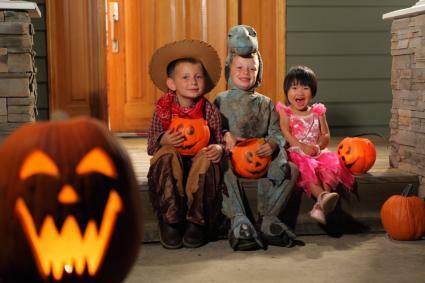 "It is important that parents understand that when a costume is exposed to an open flame such as those in a Jack-O-Lantern or decoration it is possible that the costume could catch on fire," says John Drengenber, Director of Consumer Safety at Underwriters Laboratories. 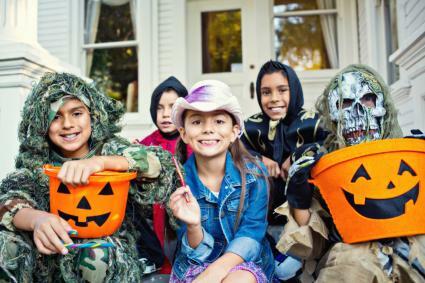 "Although costumes are not required to have a third party safety certification, parents should look for costumes that are marked flame retardant or fire resistant." In addition to the main part of your child's outfit, also look for fire-resistant accessories like wigs, beards, or fake body parts. Although masks can really up the scary factor in any costume, there's a hidden danger that would frighten even the toughest superhero or fiercest werewolf: some masks can dangerously interfere with kids' ability to see clearly. If your child wants to wear a mask, the eye holes should not limit or block the child's vision in any way and it should allow good peripheral vision. Using non-toxic makeup is an even better choice. It's also a good idea to pay attention to the length of your child's costume. If your little one has a long costume in mind, break out the sewing machine to hem it up. 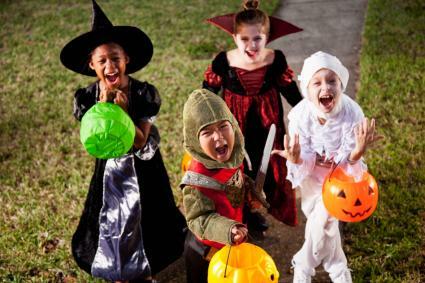 "Keeping costumes short will help prevent trip hazards as trick or treaters are running up steps and across streets," says Drengenber. Many Halloween costumes seem incomplete without the addition of props. If a prop is part of your child's costume, be sure it won't be mistaken for the real thing. Props such as guns, knives or swords can be mistaken for real weapons. If one of these props must be used, it should not look authentic. Choose one that definitely appears fake. Dark costumes can blend into the night, making it difficult for drivers to see your kids as they go about their Halloween rounds. Visibility should be an important criterion as you help your child pick his outfit. "Selecting costumes that are light colored will make the child more visible to motorists," says Drengenber. "Placing some reflective tape on darker costumes will also make the child more visible, as will carrying a flashlight." Some costumes feature battery-operated lights, sounds, or movements. Although battery-operated components don't usually pose a hazard in terms of electric shock or fire, it's important to be cautious about the batteries themselves. "Certain button cell batteries have been known to cause severe injury and even death when a young child ingests one or more," says Drengenber. "Therefore it is important that a responsible adult take the responsibility of connecting the battery and removing it from the costume (or decoration) when finished. Young children should be supervised when any small parts such as batteries are associated with a costume or decoration." Costumes are just part of the fun when it comes to Halloween. For many families, the main event is trick or treating. Keep your kids safe with these important tips. The safest time for trick or treating is during daylight hours. Even if your children are dressed as daylight-loathing vampires, they are safest before it gets dark. That way, motorists can easily see them, and they'll be home with plenty of time to enjoy their candy. Stay in populated and lighted areas. Never go into a house of someone they do not know. Never get into a stranger's car. Don't cut through alleys, fields, or parks. A flashlight is a great way to improve kids' visibility while trick or treating. Have each child carry his own light, and be sure he turns the flashlight on. "Flashlights do not usually carry a UL mark because they are battery operated and generally do not present a shock or fire hazard," says Drengenber. However, he recommends that flashlights be as bright as possible. "One that is nice and bright, such as the newer LED type, will help them see where they are going and help others see them," he says. Glow sticks are another great tool to help kids stay safe and visible at night. Discard any candy that seems questionable. Remind kids about common street safety before they head out on the town. They should walk on sidewalks whenever possible and look both ways before crossing a street. It's also important that they cross at intersections and use crosswalks, since that's where motorists will be most likely to notice them. 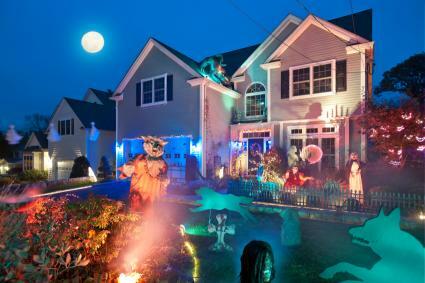 Decorating your home for Halloween is one of the most enjoyable parts of the holiday. However, it's important to keep a few safety guidelines in mind to keep your home from being dangerous, as well as scary. If you are purchasing a new electric decoration for your path, front door, or lawn, make sure it is safe for everyone to enjoy. "When purchasing Halloween decorations, make sure to shop at a reputable retailer and always look for the UL Mark on light strings, electrical decorations, and extension cords," says Drengenber. "The UL Mark on the product indicates that the product has been tested and meets rigorous safety standards." If you'll be bringing out some of your favorite decorations from years past, you should always take the time to inspect them for safety. "Cracked sockets, frayed or bare wires, and loose connections may pose a fire or shock hazard," says Drengenber. "Replace damaged light strings with energy-efficient LED lights. Never try to repair a light string. They are rather inexpensive and it is good insurance to get new lights to replace those that are damaged." Use lights ticks or battery-powered candles in any Jack-o-Lanterns and other decorations that are outside. Children are excited when they are trick or treating and a costume could accidentally catch fire if real candles are used. Some decorations are made to be used inside only, and using them outside can be dangerous. Drengenber reminds homeowners to "...look for a red UL Mark to indicate that lights are certified for both indoor and outdoor use. A green UL mark indicates certification for indoor use only. Additionally, check that electrical products are certified for outdoor use by UL and plugged into a ground-fault circuit interrupter (GFCI) outlet; to reduce the risk of shock." Halloween safety is all about being aware of the dangers and doing everything you can to keep your family safe throughout this fun night. As long as you keep safety in mind as you celebrate, your Halloween will be scary in the best way possible.